Some people might say that our neighborhood is storybook quaint. We have wide sidewalks, old trees, a location that’s within biking distance from everything we need, a simple playground, and a huge group of kids who get together regularly for planned and impromptu play dates, bike rides, and snow shoveling parties. A lot of these things are happy accidents, but I’d also say that our neighbors have put a lot of time and effort into making our neighborhood great. 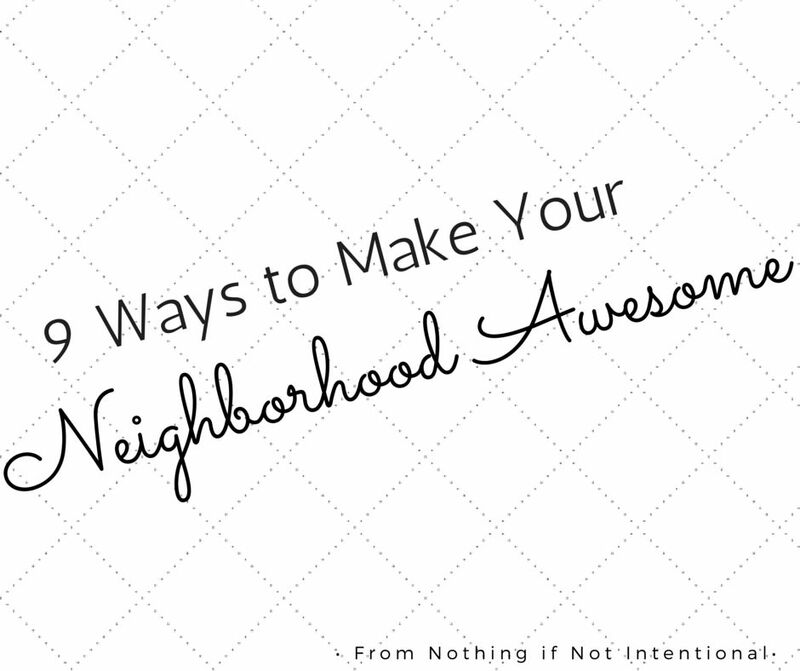 Here are 9 ideas for bonding with your neighbors and making your neighborhood the envy of the city. Host a play date. The moms in our neighborhood have bonded in part because we have young kids. We try to get together weekly for play dates in someone’s yard. When the weather is bad, there is a church on the outer edge of our neighborhood that has agreed to let us use their gym to burn off steam! Take a field trip. There are times when we’re all going stir crazy, and we need to get out. When that happens, we take trips. Our little group has gone to the zoo, splash pads, the local museum, coffee shops, strawberry fields, and apple orchards. We love a good adventure. Support your city. 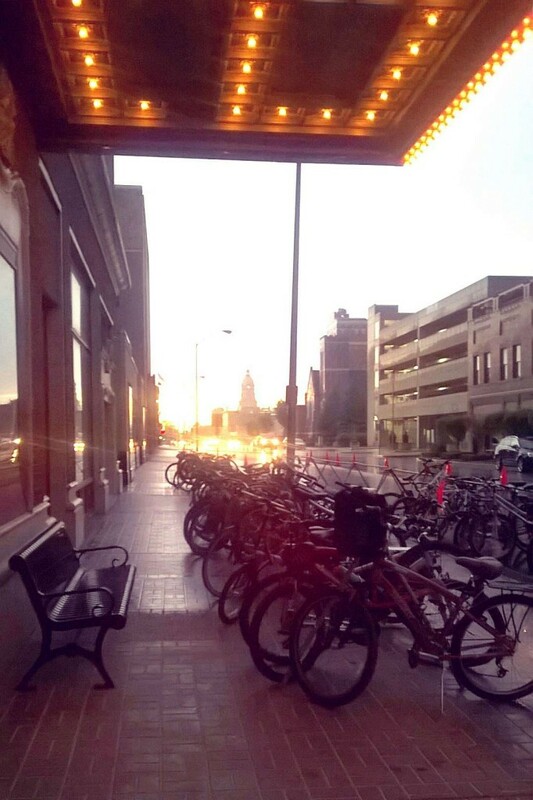 Our neighborhood is awesome in part because we share a love for trying new restaurants, buying local, and attending whatever cool event rolls through town next. Whether it’s a wine tasting or a bike rally, we’re game for almost anything. Rally for a cause. One of my neighbors worked with our city to get new trees for our beautiful boulevards. She then rallied the neighbors to get the trees planted and to keep them watered. This shared experience brought the neighborhood together and gave the neighbors a sense of ownership in our shared space. Communicate. Our neighborhood stays connected via a facebook page. On our page we talk about petty crime, annoying solicitors, the schedule for the recycling truck, houses that are for sale, and dates for the next neighborhood yard sale. 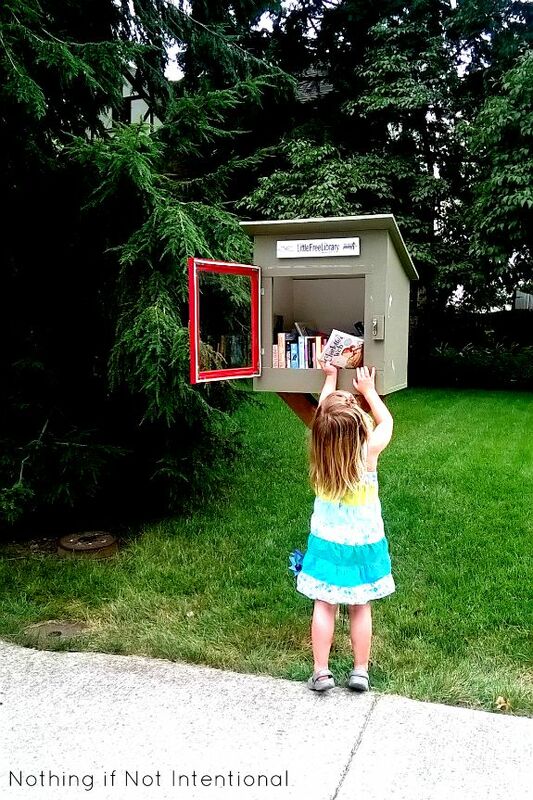 Put up a Little Free Library. This is yet another awesome idea that didn’t come from me. Some of our cool neighbor friends installed a little “library” that we use for swapping and sharing books. I love to see what our neighbors are reading. My kids love getting new books. I like having an easy way to pass on books that we’ve enjoyed but finished. Throw a neighborhood party. 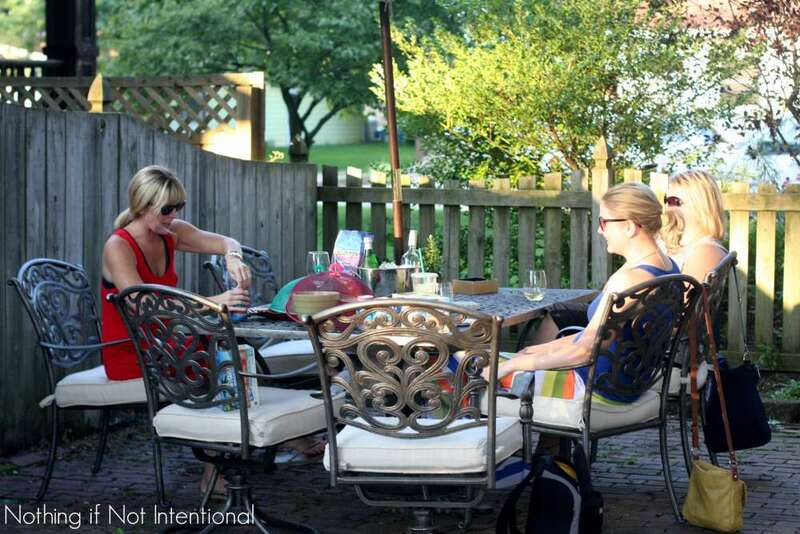 Once a year, the moms in our ‘hood agree on a date for a neighborhood party. We ask neighbors to “bring your own chair and a dish to share” and then we meet in someone’s yard or the playground to hang out, laugh, and get to know our neighbors. Last year, one of the creative moms in our group suggested we have the kids decorate their bikes, strollers, and wagons, and have a bike parade! Lean in. Could you ask your neighbors to borrow a cup of sugar or an egg? That happens all the time in our neighborhood. We pass around appliances, party supplies, childcare help, and extra produce from our gardens and cherry trees. This week a gigantic bag of coconut flour and fresh fruit showed up on my porch. When our foster tot came, our neighbors brought over bags of little boy clothes and shoes. When a new baby is born, we start a meal train. That’s what good friends and good neighbors do. Get together without the kids. As a stay-at-home mom, I can get twitchy if I don’t get enough time to talk and laugh with my friends. Thankfully, the moms in our ‘hood regularly get together for mom-only time. 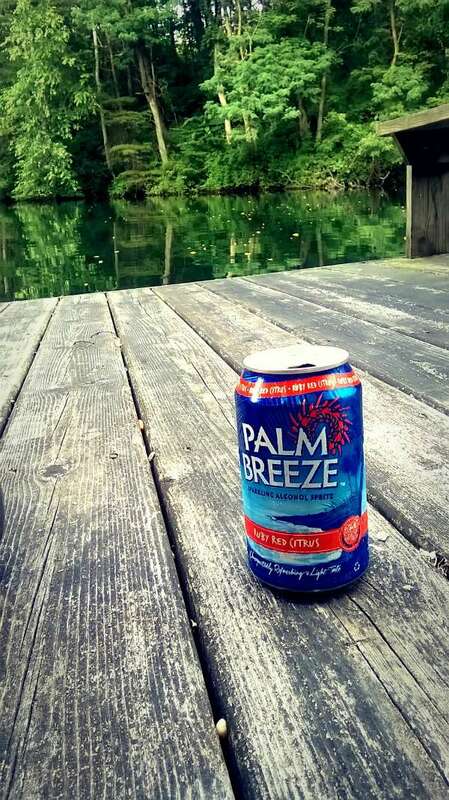 I accepted this post assignment in part so that I could donate the Palm Breeze product I was given to the worthy cause of our most recent MNO (Mom’s Night Out). Palm Breeze is a flavored malt beverage. Which basically means it’s an alcoholic drink made with a malt base, kind of like beer. You can see why it would be hard for us to ever move, right? It would be painful to leave this awesome neighborhood behind! But I do believe that a little group effort can go a long way towards making any neighborhood great. ← Riding the Rails: 25 Tips for Taking a Train Trip with Kids in the USA!